HomeNewsCYBER CRIMINALS – What is Government Doing? CYBER CRIMINALS – What is Government Doing? Cybercriminal Daniel Kaye, the man who broke down Liberia’s internet in 2016, looks so much like the German attacking midfielder Mesut Ozil; but that’s how far the similarities between the two “attackers” might ever go. While Ozil plies his trade legitimately with English football club Arsenal, Kaye on the other hand is a razor sharp English international cybercriminal who used his skills to attack and crash Liberia’s internet systems in 2016, few months before the West African nation’s third post-war presidential elections – with the backing of another top Liberian telecom competitor. In the wake of the 29-year-old Kaye’s indictment and sentencing to 32 months in prison few days ago, Lonestar Cell MTN, the company which is said to have suffered the brunt of Liberia’s 2016 cyberattack, has now confirmed that it has provided a business impact statement in criminal proceedings against Daniel Kaye. According to Lonestar Star Cell MTN, the criminal proceedings against Mr Kaye relate to a sustained cyber-attack carried out between late 2015 and early 2017 by Mr Kaye (and other parties) on Lonestar Cell MTN. “The cyber-attack was a targeted and sustained act of industrial sabotage designed to disrupt Lonestar’s business and that of our customers, so as to advantage Lonestar’s competitors. The attack caused considerable damage to Lonestar’s business and disruption to our customers in Liberia. In those circumstances, Lonestar Cell MTN and MTN Group considered it was appropriate and indeed important to provide a business impact statement to explain the impact of the cyber-attack on Lonestar,” a January 13, 2019 press release from Lonestar Cell MTN indicated. The statement furthered that Lonestar Cell MTN has commenced civil proceedings in the English Commercial Court against a number of parties in relation to the cyber-attack carried out against Lonestar; and that the Defendants to the proceedings are Mr Kaye, Mr Avishai Marziano, Cellcom Telecommunications Limited, Mr Ran Polani and Orange Liberia, Inc.
Mr. Kaye is said to have been hired in 2015 to attack Lonestar, Liberia’s leading mobile phone and internet company, by an individual working for Cellcom, its competitor, for up to $10,000 a month using his skills to damage Lonestar’s service and reputation. The hacker’s weapon in this case was the “Mirai #14” and cheap Chinese webcams. In November 2016, working secretly out of Cyprus and controlling the botnet via his mobile phone, Kaye ordered it to overwhelm Lonestar’s systems. On his command, hundreds of thousands of the webcams. began firing data requests at the west African company. The system began to struggle to manage the demands and parts of the infrastructure crashed. Classified documents in possession of Insight show that, indeed, Mr. Daniel Kaye was used by Cellcom Liberia, which sold its shares to Orange, to damage Lonestar Cell MTN. 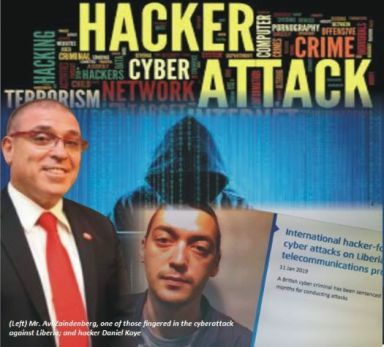 In a documentary excerpt, Mr. Kaye fingered one Avi of LISCR as one of the main brains behind the wicked Liberia cyberattack. Though Kaye said he could not provide Avi’s surname, he could however recall Avi as working with LISCR, and a communications provider in Liberia, Cellcom. For the record, the only Avi who held dual positions at LISCR and Cellcom is Avi Zaindenberg. This paper is also reliably informed that the George Weah-led government has now entered into an agreement with Mr. Avi Zaindenberg to monitor all international calls to and from Liberia. The Liberia Telecommunications Authority (LTA) is the regulatory and competition authority charged with the statutory responsibility to ensure a vibrant telecommunications sector in Liberia, through the effective use of telecommunications and Information Communications Technologies (ICT). When this paper contacted the LTA authorities about the recent development regarding its view of the reported hacking of Liberia’s cyberspace, this is what the current Chairperson of the LTA, Mr. Ivan Brown, said. Mr. Brown intimated to Insight that the government of Liberia, through the LTA, has been working with MTN and Orange regarding the reported hacking of Liberia’s internet systems. “What you are talking about, is not news to us,” he indicated. When contacted to give their side of the cybercrime saga, Orange head of corporate communications Kimmie Weeks said Orange will not comment on the issue for now. “At the appropriate time, we will be making an official statement,” Weeks said. James Jallah is a senior student at one of Liberia’s promising tertiary institutions, where he studies criminal justice. Jallah wonders why the Liberian government would continue to do business with a person of interest in a major national security threat case. “By now, I don’t know why Mr. Avi Zaindenberg remains the darling of this government. These are the same people who used our own country resources to support Charles Taylor to break down our country. They supported Ellen and her son Robert to steal from our poor citizens, and now, they are using George Weah to suppress us economically,” Jallah lamented.